Hole in the Wall - Coffee Bay Accommodation. Please note that a 4x4 is required for travel to this resort. 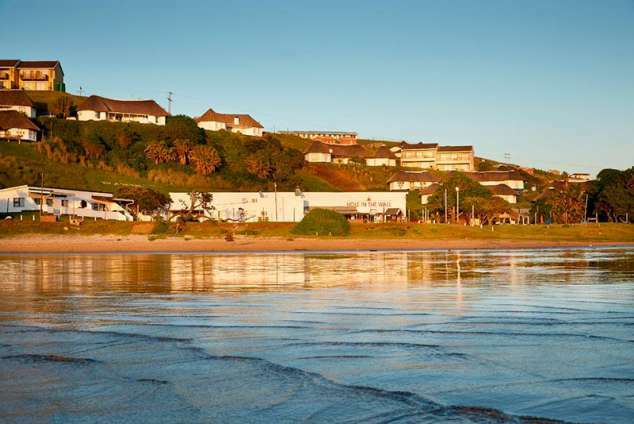 Situated in Coffee Bay and surrounded by vast stretches of unspoiled coastline, Hole in the Wall Hotel and Holiday Village offers some of the most picturesque scenery in South Africa. Hole in the Wall provides the perfect base for those wanting to get away from the stresses of modern day city life. The remoteness of Hole in the Wall resort lends itself to excellent bird watching, nature walks, hiking trails as well as being an ideal spot for fishing. The beach is directly in front of the resort and has a lovely natural bay. This secluded location makes it the perfect destination for a relaxing holiday and the ideal base from which to explore the pristine Wild Coast. The accommodation at Hole in the Wall comprises apartments, chalets and suites dotted amongst rambling gardens on a cliff top overlooking the ocean, with up to 4 bedrooms. Some of the accommodation features private braai areas - perfect for al fresco dining under the clear Wild Coast skies. This cosy self-catering room has a partial view of the Indian Ocean and is close to the communal braai facilities and the swimming pool. The terrace includes a private charcoal braai area. This accommodation sleeps 2 in a double bed and the en-suite bathroom has a shower, toilet and basin. This basic en suite has two twin beds as well as tea and coffee making facilities and an en-suite bathroom with shower, toilet and basin. These self-catering chalets are located close to the pool and have beautiful views over the gardens or the sea which can be enjoyed from your private braai area. The bedroom sleeps 2 in a double bed and the bathroom has a shower, toilet and basin. These spacious self-catering chalets have garden or sea views and are found close to the swimming pool. Each chalet has a private terrace with a charcoal braai and accommodates up to 4 people, with a double bed in the main bedroom and bunk beds or 2 single beds in the second bedroom. There is a shower, toilet and basin in the bathroom. This large self-catering chalet has a sea view and accommodates 8 guests with a double bed in the main bedrooms and second bedrooms and single beds or bunk beds in the third and fourth bedrooms. The main bathroom has a shower, bath, toilet and basin and the second bathroom has a shower, toilet and basin. This basic en suite has a double bed as well as tea and coffee making facilities and an en suite bathroom with shower, toilet and basin. These self-catering apartments are located close to the hotel. The bedroom sleeps 2 in a double bed and the bathroom has a shower, toilet and basin. This en suite has three bunk beds sleeping six guests as well as tea and coffee making facilities and an en-suite bathroom with shower, toilet and basin. These spacious self-catering chalets have sea views and accommodate 8 guests with a double bed in the main bedrooms and second bedrooms and single beds or bunk beds in the third bedrooms. These self-catering apartments are found close to the hotel. Each apartment accommodates up to 6 people, with a double bed in the main bedroom and bunk beds or 2 single beds in the other bedroom. There is a shower, toilet and basin in the bathroom. These self-catering apartments are found close to the hotel. Each apartment accommodates up to 4 people, with a double bed in the main bedroom and bunk beds or 2 single beds in the second bedroom. There is a shower, toilet and basin in the bathroom. Take a night off from cooking while visiting us. Our cosy onsite restaurant, the Bell Bouy, offers delicious a la carte options for breakfast, lunch, and dinner with a choice of tasty seafood, meat and vegetarian dishes, including delicious wood-oven pizzas. La Vita Spa provides a haven for guests to enjoy a wide range of wellness massages, anti-ageing treatments, manicures and pedicures, available to men, women and children. The facility includes treatment room, extended trading hours, a relaxation area, plus a great gift collection. Coffee Bay and Hole in the wall, offer a great spots for shore angling, which also makes it a popular place for daring fisherman to try their luck at catching the elusive kob by night along with dorado, salmon and musselcracker, crayfish and mussels. This small but beautiful coastal reserve lies in a forested valley south of Port St Johns, and stretches all the way from Second Beach to Sugarloaf Rock. Trails lead to evergreen forests providing the opportunity to view many species of indigenous birds. Combining lush indigenous forests, a beautiful rocky coastline, unspoilt beaches and rolling grasslands, the Hluleka Nature Reserve lies along the ancient Wild Coast within the district of Ngqeleni, comprising magnificent coastal forest reserves. Visit the Coffee Shack in Coffee Bay, take a hike and enjoy a thrilling experience when you abseil down baby hole, a 45 metre cliff drop into the ocean. Afterwards relax under the trees or go for a swim followed by toasted sandwiches prepared on an open fire. The amazing hiking path from Coffee Bay to Hole in the Wall traverses craggy sea cliffs and ongoing rolling green hills and is approximately 3 hours in either direction. Take a hike to Mapuzi Caves along the seaside cliffs where the brave can leap into the ocean from 14 metres up or relax in the natural Jacuzzi at the end of the trail. This is a beautiful trail with gorgeous views of the ocean and the rugged coastline. The Hole in the Wall resort is not suitable for access by wheelchair. The resort has pathways between the chalets. Join us for our weekly guest braai or take a break from the kitchen and come dine with us at our laid-back onsite restaurant, Bell Buoy, that offers refreshment for all tastes at every mealtime. The cosy restaurant offers delicious a la carte options for breakfast, lunch, and dinner. The restaurant is open from 8 until 10 in the mornings and from 12 until 2pm for lunch and from 5 to 8:30 for dinner. On Saturdays and Sundays, lunch is from 12 to 3 and dinner is from 6 until 8:30. Don’t miss out on delicious pizzas and seafood! La Vita Spa provides a haven for guests to enjoy a wide range of wellness massages, anti-ageing treatments, manicures and pedicures, available to men, women and children. The facility includes treatment room, extended trading hours, a relaxation area, plus a great gift collection. The Spa is open from 8am until 10pm daily. Please note that a 4x4 is required for travel to this resort. From Durban, go to Port Shepstone and take the N2 to Kokstad. From Port Elizabeth, take the N2 to Grahamstown. Take the N2 south from Umtata and then take the Coffee Bay/Mquanduli turnoff. The turn off is 16km from the Shell Ultra City just outside Mthatha. Travel for approximately 57kms on the gravel road towards Coffee Bay. Look for the signpost to the resort on the left hand-side. The resort is approximately 19kms along the road. 2320 page views since 27 Jun, 2018.